A new era of recreation launch in this neighborhood on June 23, 2018 at the Fitzmorris Recreation Center and Outdoor Pool Opening Celebration. 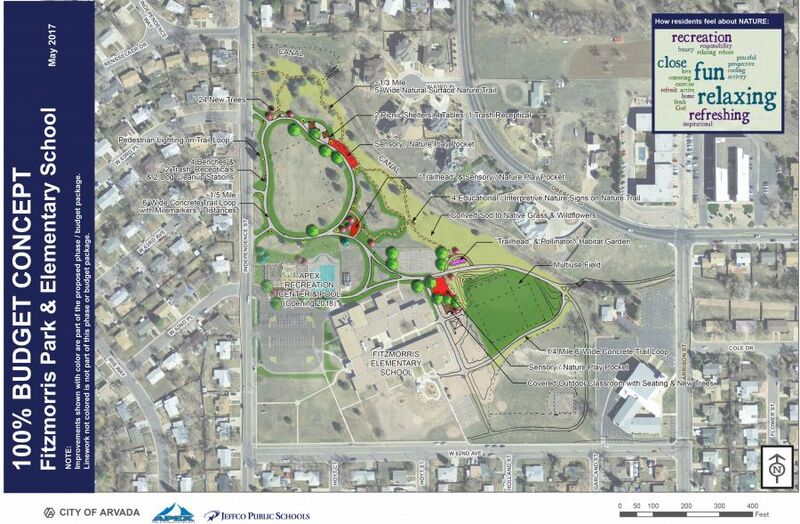 The City pursued a Great Outdoors Colorado (GOCO) “Inspire” Initiative planning grant in partnership with Jeffco Public Schools to benefit park and schoolyard upgrades at Fitzmorris Park and Fitzmorris Elementary School in 2016-2017. The grant sought to inspire Colorado youth and families to enjoy, appreciate, and protect Colorado's great outdoors. After Pool and Rec Center outreach in early 2016, additional park designs reflecting public comments were created to illustrate the park and schoolyard’s potential as a place to recreate, learn, explore, and grow. These designs were the basis for gathering Jeffco Public Schools and Be Wild, Jeffco support to participate in the GOCO grant. Through the first half of 2017, Fitzmorris was the center of a design and prioritization process led by you - the community - to help youth, families, and all residents get outdoors and experience more personal connections to nature. We compiled your feedback to develop a master plan representing the ideal environment to connect youth to the outdoors at your neighborhood park. The concept below represents improvements desired by the community and possible with a $1M grant request. Download conceptual drawings here. Grant funding was very competitive. In December 2017, the City, alongside Be Wild Jeffco, were not awarded funding to implement the grant proposal. January - June 2017: Community engagement, Public outreach, Outdoor Youth Leadership events. Compile results, develop programs, master plan and costs for the Implementation Grant. December 2017: Be Wild Jeffco and the City of Arvada not invited to continue competing for funds. 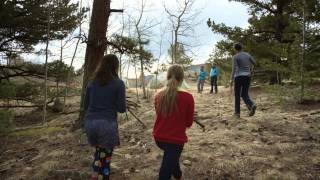 Elementary, Middle, and High School Students participated in the Outdoor Leadership Program in 2017, made possible through the GOCO Inspire planning grant. For Fitzmorris Recreation Center and Outdoor Pool questions and concerns, contact Apex Park & Recreation District Main Line: 303-424-2739 or Apex Fitzmorris Recreation Center Direct Line: 303-463-1925.